John Burgess Fisher, 97, of Salisbury, North Carolina passed away Tuesday, December 20, 2016 at the NC State Veterans Home. Born September 19, 1919 in Salisbury, he was the son of George A. and Iula Beall Cheely Fisher of Salisbury. John is the grandson of James Burgess Cheely, great-grandson of Mary Elizabeth Virginia Morrison, great-great grandson of Mary S. C. Gaither in the Gaither line of John Gaither IV, John III, John II, and John Gaither I. A graduate of Boyden High School, Class of 1936, and Catawba College, Class of 1940, as well as a graduate of Rutgers University School of Banking. He was Executive Vice President of Security Bank & Trust Company of Salisbury. His influence as a Banker is well-known. He served Security Bank for 44 years. Active in Civic Affairs, he served as President of the Salisbury Junior Chamber of Commerce, and the Salisbury Lions Club, where he was Lion of the Year in 1995, was a Melvin Jones Fellow, Jack Stickley Fellow and received the William Woolard Award. He served as Treasurer for the campaign to build the YMCA as well as a Board Member. 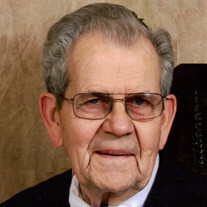 He has been a member of the Salvation Army Board of Directors for over 60 years and was a Life Member. He has been a member of the Catawba Chief’s Club since its inception and served as Chairman in its early years. Some other awards he received include the Young Man of the Year of Salisbury in 1948 & 1949. He served as the first Chairman of the Redevelopment Commission (In charge of Urban Renewal for Salisbury) for 10 years and as Vice Chairman for another 10 years. A loyal Presbyterian and a member of Maupin Avenue Presbyterian Church, John has served as an Elder, Clerk of Session for over 57 years. He has past served as a Deacon and Trustee. John is a Past President of the Brown-Fisher Association having served as Treasurer for over 40 years. John’s main hobby has been Genealogy. He has researched both sides of his family and has published three books. One of his books, “Ancestors and Descendants of Abraham Brown (Braun) was awarded second place in the National Contest in Kansas City by its Genealogical Society. A veteran of World War II, he was in the South Pacific in the Solomon Islands and the Phillipines. In addition to his parents he was preceded in death by his wife, Esther Lesslie Fisher on September 11, 2013. Those left to cherish his memory are his son, Mark L. Fisher (Misty); daughter, Eleanor F. Corriher; grandchildren, Kelli Fisher, Joshua Polk (Sabrina), Nathaniel B. Boyd, IV (Amanda); great-grandchildren, Maddison Boyd, Cooper Boyd, Archer Polk.